Raised in The Dalles, Israel Ayala comes to One Community Health with over four years of experience in the Columbia River Gorge, interpreting in a variety of medical settings such as family medicine, physical therapy, ENT, urology, emergency services, radiology and oncology. Israel is a strong believer in power of positive attitude while providing the best service he can. He takes pride in providing patients with a warm service and enjoys finding ways to help build teamwork in the workplace. Israel has the most fun attending live music events and live sports. He also enjoys comedy, cooking/eating, graphic design and plays vinyl records on turntables. Michele Guerrero is the enabling services manager at One Community Health, where she oversees chronic disease management programs, interpretive services, community outreach, and other OCH programs. Michele is a native of the Gorge and enjoys supporting her hometown community with prevention and wellness programs. Prior to joining OCH in 2018, Michele worked for Yakima Valley Farm Workers Clinic (YVFWC) in various roles, including as a WIC clinic supervisor, primary care Registered Dietitian (RD), and finally as the primary care nutrition services supervisor. She was instrumental in developing and managing YVFWC’s cutting-edge integrated RD model of care. Michele has served in many leadership roles, including with the Nutrition Council of Oregon, Academy of Nutrition and Dietetics, Oregon State WIC program, and Oregon State University’s Dietetic Internship. Michele’s leadership in the dietetics community was recognized with the Oregon Academy of Nutrition and Dietetics’ 2017 Young Dietitian of the Year award. Michele earned her Bachelor of Science in Nutritional Sciences and Dietetics from Seattle Pacific University and completed her Dietetic Internship at Oregon Health and Science University. She enjoys yoga, weight stigma advocacy work and traveling, particularly rambling through the Scottish Highlands. Joan is passionate about empowering people with knowledge and partnering with them in navigating their health care needs. She started her nursing career as an ICU nurse, gained experience as a mother, and then became a certified diabetes educator. With the latter, she knew this would have the greatest impact to prevent long-term complications in health. After a short stint in Spokane, Wash., Joan has come back to Oregon to work with us and be close to some of her relatives. She loves family, friends, crafts and her dog. She is so excited to be in the Gorge and giving her all. Esther Mondragon serves as the enabling services manager for our perinatal program and also works as a team nurse. Esther completed nursing school at Portland Community College in 2010. She was born in Mexico City but grew up in The Dalles, where she still lives today. Esther has been drawn to working at One Community health because she is passionate about community health, supporting our diverse patient population, and, of course, practicing perinatal care and delivering high-quality, personable services and solutions. In her free time, Esther spends time with her family and dog. She also loves to run and uses that as a way to decompress and sustain her own health and wellness. Vicky Valle has worked for One Community Health's Perinatal program since 1991 as both a certified Community Health Worker and a Perinatal case manager. She enjoys providing prenatal and postpartum education to pregnant and postpartum women and their families, both one-on-one and in group settings. She helps to ensure that women get adequate prenatal care, which reduces complications in the pregnancy, and Vicky has seen first-hand our excellent results in pregnancy outcomes and breastfeeding. She is widely known and respected in our community for her years of service helping families adjust to the arrival of a new baby. She has been an amazing asset to our team! Delfina Reyes has worked for One Community Health’s perinatal program since 2005. She provides education and support to pregnant women and women who have recently had a baby. She enjoys working with pregnant women and helping them get the care and services they need, everything from prenatal education to dental exams and even our behavioral health services. Delfina has witnessed how our health promotion programs have made a dramatic difference in the lives of our patients over the years. Patients are often more relaxed about talking to the community health workers than they are talking to their provider, and the community health workers have the opportunity to give them that extra care and attention. 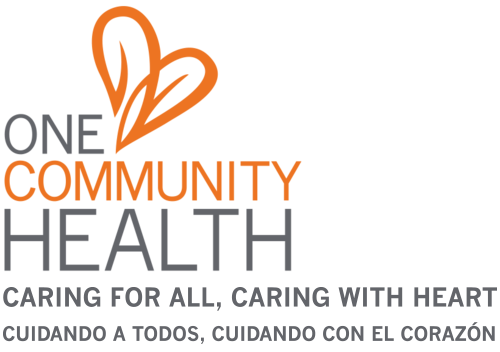 Evaristo Romero has worked for One Community Health’s Salud program since 2003. He loves the opportunity to teach patients and make a difference in their disease management. He has recently gained new skills in helping people manage their weight in a healthy way and has been very popular in that role. He teaches classes and provides one-on-one support for many patients. As someone who long ago worked in the orchards and saw the benefit of health of wellness, he knows that health promotion programs enable the clinic to reach many more people in ways that are effective for conveying health information and support. Over the years, Evaristo has created valuable connections with our local patients as well as the returning migrant farmworkers we serve both at orchards and in special health clinics throughout the summer months. Caitlyn Witte moved to the Columbia River Gorge in 2016 after graduating with her bachelor of science in clinical nutrition. Caitlyn studied clinical nutrition at Francisco Marroquín University in Guatemala where she was able to obtain vast clinical experience and become fluent in Spanish. Caitlyn’s clinical rotations throughout her education included some of the main public hospitals in Guatemala. There, she was able to head various pediatric departments as well as gain experience with Johns Hopkins All Children’s Hospital. Caitlyn is currently in the process of obtaining her RD credentials here in the United States. She is passionate about our Salud program and helping meet patients where they are with individualized plans to provide some of the best preventative medicine there is—quality nutrition! Jennifer Wardell started work at One Community Health as a registered nurse in the Hood River clinic. About three months after starting with there, she moved our facility in The Dalles and has been there ever since. Jennifer works as the Salud program RN in The Dalles and became a certified diabetes educator in 2017. Jennifer enjoys working with and helping patients improve their overall health and meeting their health goals. Jennifer first became interested in working in the field of diabetes when she worked for Portland Diabetes and Endocrinology clinic, assisting in clinical research studies. In her off time, Jennifer enjoys time with her family and being outside as much as possible either hiking, skiing, running, or biking. Jennifer has lived in the Columbia River Gorge since 2001 and loves making The Gorge her home. Josefina “Josie” Luna, is one of our qualified Spanish medical interpreters at One Community Health. Born in White Salmon, she grew up mostly in Hood River and has held prior positions in health care, working at Central City Concern and Oregon Health & Sciences University, prior to joining our team. At One Community Health, Josie has held positions with us as our medical records clerk and team assistant. Josie brings her infectious smile to One Community Health and puts our patients at ease, which is always helpful in terms of enabling good communication between them and our providers. When she’s not busy interpreting for us, she loves traveling and makes an effort to do this at least once or twice a year. She find exploring other places fun and exciting because she appreciates learning the similarities and differences among cultures around the world.